Michaels Jewelers: Is Service Worth The Premium? Michaels Jewelers is not a terrible choice to buy a diamond. They had some decent jewelry there and the prices weren’t outrageously more than their competitors. But I couldn’t find a single reason to buy from Michaels. Their offerings weren’t that impressive, the store experience was ho-hum and the prices were high. You are better off buying a diamond from a reputable online retailer like James Allen or Blue Nile. Read more to see why we wouldn’t recommend Michaels Jewelers and contact us for unbias and free diamond buying assistance. Michaels Jewelers is another jeweler in the Northeast with a long and storied history. Going back more than a 130 years ago, Abraham Michaels started a wholesale jewelry business in Halifax, Nova Scotia. His son, Irving Sr., moved to New York and continued in the wholesale business. Way back in 1911, Irving Sr transitioned to the retail side of the business. Shortly thereafter, they expanded to Connecticut where they currently have 10 stores around the state. Annie and I finished up our secret shopping road tripping by heading from New York to Boston where we were flying back over the pond from. As we mentioned before, Michaels is mainly spread out over Connecticut so it was a perfect place to break up the driving. We decided to stop off at their location in Orange, Connecticut. The location was nice, but very generic. It didn’t have the same feeling of elegance as a place like Windsor Jewelers did, or the trendy ambiance of Spence Jewelers. It was just completely non-descript. Nothing wrong with that, but I would have preferred if there was something noteworthy to mention. It was mid-afternoon on a weekday, so it was no surprise that the store was empty. We were the only customers in the store. Despite it being a decent size location, we only saw one person working there when we walked in. There was some activity in the back and a saleswoman popped out from the back to help us. The saleswoman was eager to help, but seemed to be a bit all over the place with information. She talked about how important certificate and color was, then the next minute showed us a non-certified L color diamond. It just was very hard to keep up and it didn’t seem like they have a single philosophy in terms of what diamonds they should be providing to their customers. As I said, it was all over the place. The first diamond we looked at was a 1.21ct H color, SI1 clarity round diamond. The diamond was certified by AGS and had an ideal (0) cut grade. I was a little surprised as I thought AGS only gave diamonds a 0 grade if the depth was under 62.5%. This diamond was just a smidgen higher. Nevertheless, it was a very nice looking diamond. 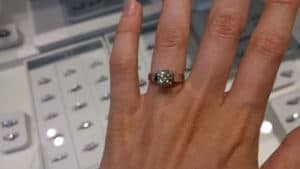 Along with the 18kt white gold solitaire setting, the cost was $10,995. The second diamond was far more problematic. There was no certification, so I couldn’t really figure out what it was. The lighting in the store wasn’t that great, but I was very unimpressed with the color. When I asked about certification, we were told that no one certifies L color diamonds. Well, as you will see below, that is not the case. 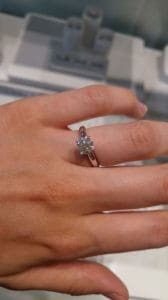 This one was also set in an 18kt white gold solitaire setting and cost $7,950. So let’s start with the carat and a quarter we looked at and compare it to a diamond from Blue Nile. Here is a virtually identical 1.20ct G color, SI1 clarity excellent cut diamond for $6,571. The diamond is at least equal to the diamond from Michaels. If you add this solitaire setting to put the diamond in, the total cost is $6,971 for a savings of 36%. Let’s move on to the more problematic diamond. Despite the salesperson’s claims, I was able to find a nice GIA certified L color diamond on James Allen. Here is a 1.61ct L color, VVS1 clarity excellent cut diamond for $5,890. If you pair it with this solitaire setting, your total cost will be $6,420. The choice from James Allen is vastly superior (legitimate certification, higher clarity, fantastic cut) and yet Michaels was still 25% more expensive.